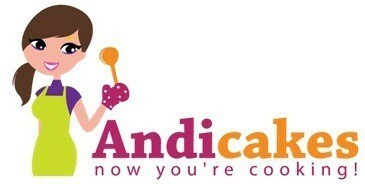 First prepare the brine for the pork by placing 4 quarts of cold water into a container. Next add the salt, sugar and liquid smoke and stir to dissolve the sugar and salt. Add the two pieces of pork to the brine liquid and cover and place in the refrigerator for 2 hours. After 2 hours remove the two pieces of pork and completely dry them with paper towel. Preheat the oven to 325 degrees F. Prepare a sheet pan or two half sheet pans lined with aluminum foil securely to capture drippings and liquid. 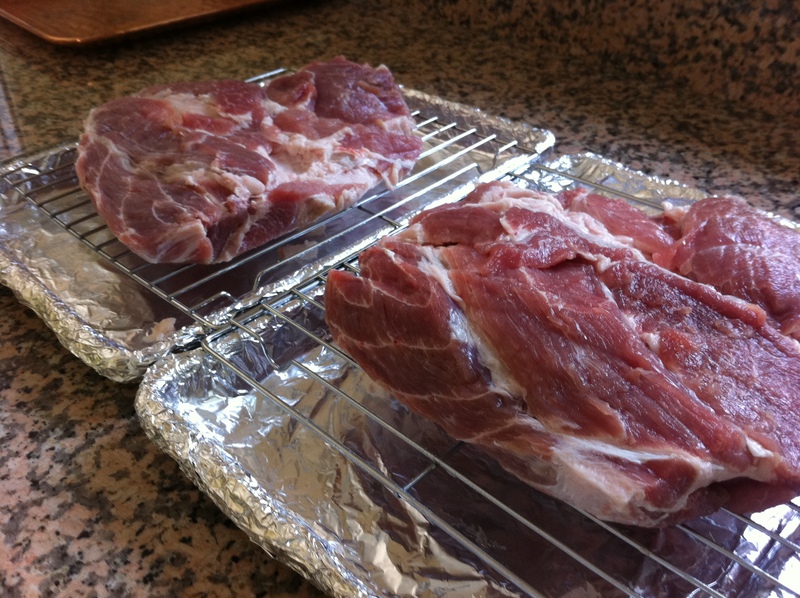 Insert a wire rack into the aluminum foil lined sheet pan(s) and set the two pork pieces on the inserted wire rack. Now prepare the rub. In a small bowl combine the salt, sugar, black pepper, paprika, cumin, garlic powder and cayenne pepper until fully incorporated. In another small prep bowl combine the mustard and liquid smoke until incorporated. 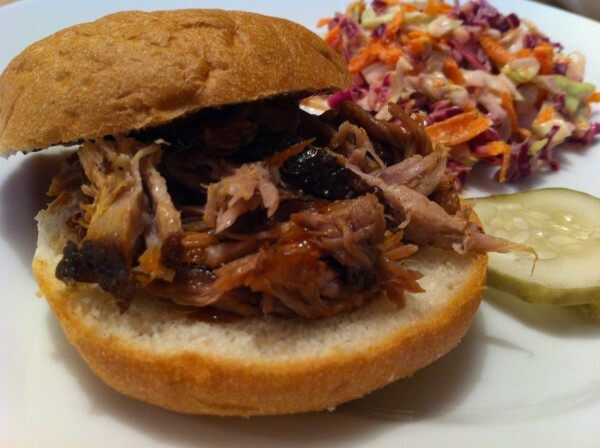 Now divide the mustard mixture by pouring ½ over each piece of pork and spread evenly with clean hands on both sides. 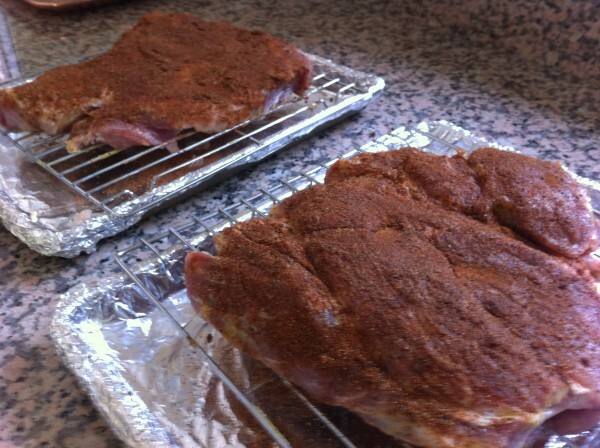 Now divide the rub mixture using half on each piece of pork that has been rubbed with the mustard liquid smoke mixture. 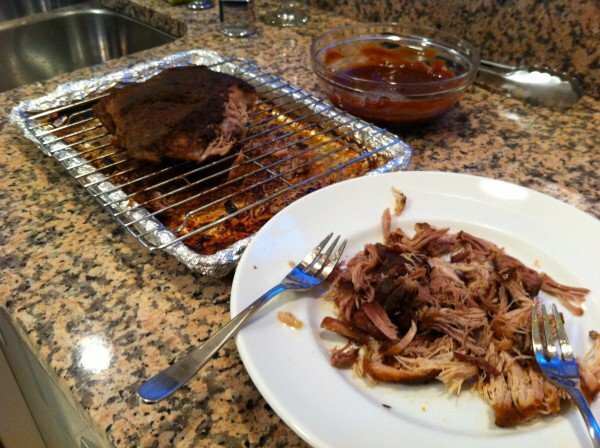 Cut two pieces of parchment paper just wide enough to cover the tops of each rubbed piece of pork and then completely cover the sheet pan(s) with aluminum foil very tightly so no steam can escape the pork while it cooks. 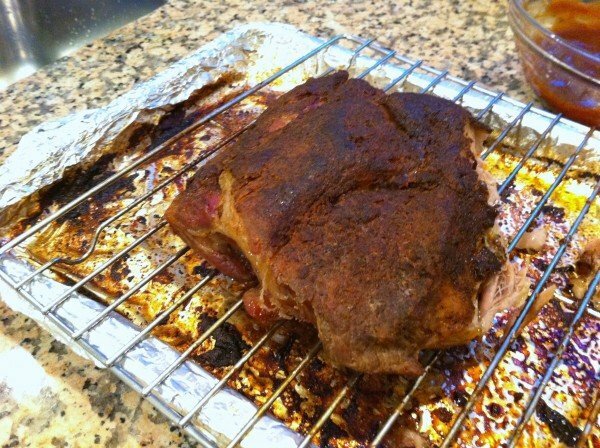 Roast the pork for 3 hours without disturbing. 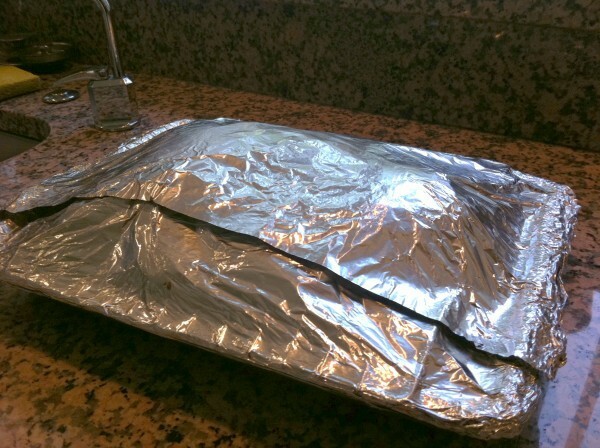 After 3 hours remove the sheet pan(s) from the oven and carefully remove the foil as very hot steam will release. Next remove the parchment paper. Carefully pour the liquid that has collected on the bottom of the sheet pan(s) and pour into a fat separator and reserve this liquid to make barbeque sauce later. Place the pork back on the foil lined pans fitted with wire rack now uncovered back into the 325 degree oven for another 1 ½ hours. 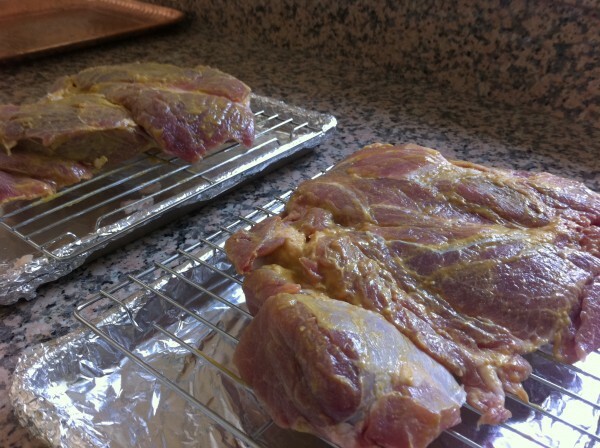 The internal temperature should be 200 degrees F. Remove the pork from the oven, cover with foil to rest for 30 minutes. Meanwhile prepare the bbq sauce by combining the ketchup, molasses, Worcestershire, Tabasco, salt, pepper and ½ cup of the reserved liquid that has fat removed. Combine the ingredients well with a whisk and set aside. 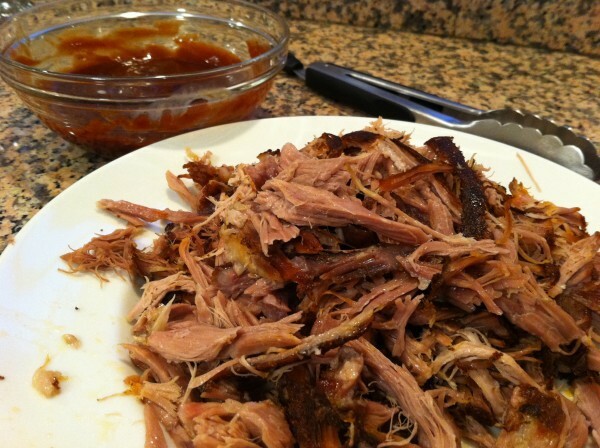 Now shred the pork using two forks, the meat should pull very easily into shreds and place onto a serving platter either with some of the bbq sauce tossed or completely on the side. 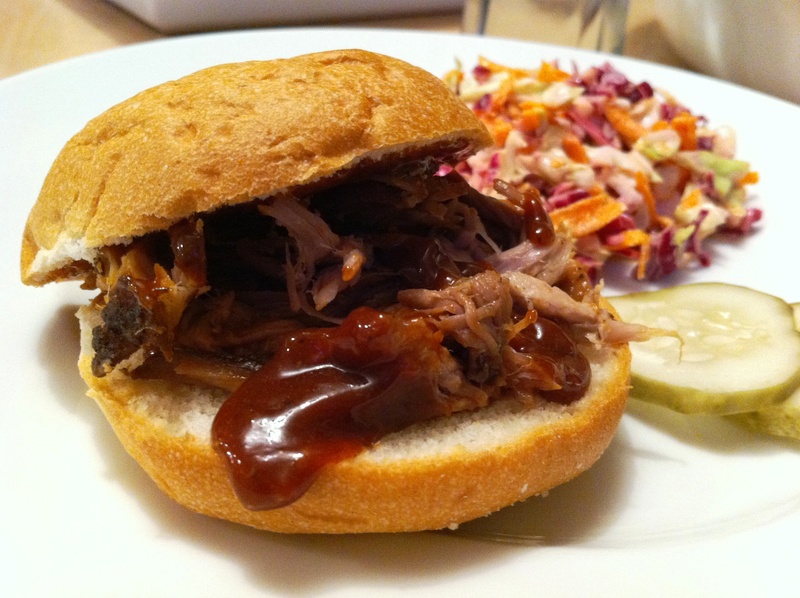 Serve the shredded pork on soft rolls with bbq sauce.